Tamar, Rahab, Ruth, and Bathsheba were strong women who had a vision of God's faithfulness at crossroads in the history of Israel. These four women took the initiative at crucial stages and made decisions that changed the future. Tamar means date palm, a name that suggests; strength, food, shade, and life. As Judah eventually acknowledges, Tamar is more righteous that Judah in this story. Emile Vernet was most famous for his battle scenes. He was a young man at the time of Napoleon, and was intrigued by the glamour and horror of war. When he painted this story from the Bible, he chose an incident in which a battle is being fought between Judah and Tamar for her right to a child. Modern images of Biblical characters are derived from the artists, who accompanied Napoleon on his conquest of Egypt. 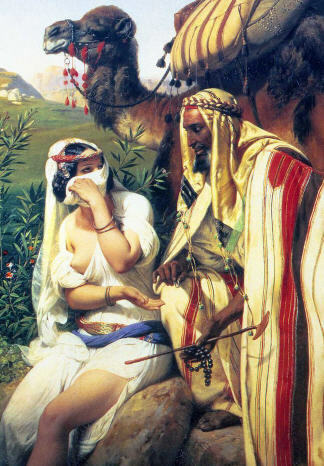 This detail from the 1840 painting by Emile Vernet of Judah and Tamar depicts the incident in Genesis 38:15-18. Although there is no reference to a camel in the story of Judah and Tamar in Genesis 38, it is possible that Judah acquired a camel from the incense traders, when he sold his brother Joseph to them for twenty pieces of silver. The seal in this story is more likely to have been an ancient cylinder seal like those found in Mesopotamia rather than a ring as depicted by the artist. 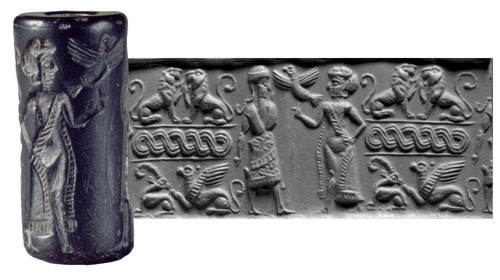 This ancient cylinder seal shows that encounters like that between Judah and Tamar were part of the cultural norms of that era.